Persistent fifth aortic arch (PFAA) is thought to be an extremely rare congenital heart disease (CHD). Most of the previous reported cases were associated with major cardiac anomalies and were diagnosed coincidentally. We report a case of PFAA with patent ductus arteriosus (PDA) that caused congestive cardiac failure in a 5-month-old baby. A 5-month-old boy weighing 3500 g presented with history of fast breathing, diaphoresis during feeding and recurrent respiratory tract infections since birth. He was born at 32 weeks of gestation with a birth weight of 2070 g.
Physical examination revealed heart rate of 140 beats per minute, respiratory rate of 60 per minute with subcostal retractions and blood pressure of 80/40 mmHg in the right arm. Oxygen saturation in room air was 95% in the right upper limb and 93% in the lower limb. The peripheral pulses were bounding with no radio-femoral delay. The precordium was hyperdynamic and the apex beat was located in the left fifth intercostal space at the mid-clavicular line. On auscultation, first heart sound was normal and second heart sound was narrowly split with loud pulmonary component. No murmurs were audible. Chest radiography demonstrated cardiomegaly (cardiothoracic ratio 65%) with right atrium and right ventricle enlargement. Lung fields were plethoric. Electrocardiogram demonstrated biventricular hypertrophy with QRS axis of 90°. Echocardiography revealed a large PDA with predominant right to left shunt and severe pulmonary arterial hypertension. On suprasternal view, the aortic arch was left sided with transverse arch measuring 7 mm. Only two arch vessels were seen, with the first vessel probably trifurcating. Isthmus just after the second vessel measured 4 mm; hence, coarctation was suspected [Figure 1]. The coarctation segment did not look narrow enough to explain predominant right to left shunting of PDA. To delineate the severity of coarctation and the arch anatomy, cardiac computed tomographic angiography (CT angiography) was planned. CT angiography showed a large left-sided PDA with left aortic arch. 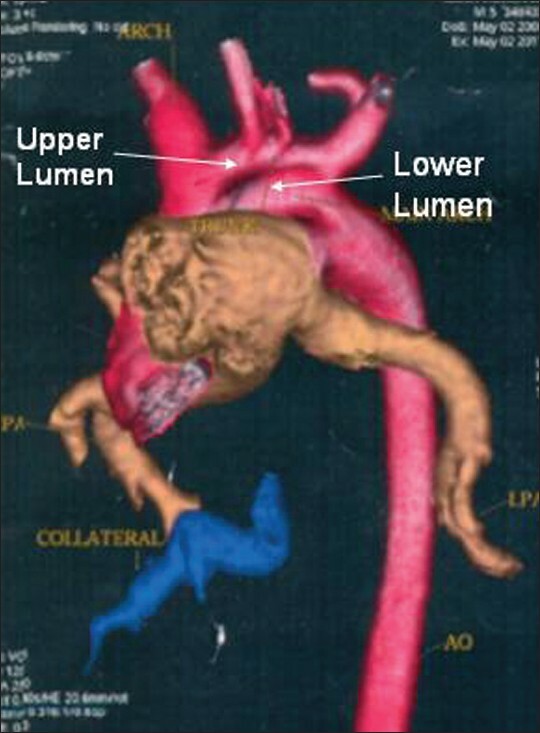 The arch had two lumina and the left carotid and subclavian arteries were originating from the upper lumen [Figure 2]. The diagnosis of double-lumen aortic arch was made. There was no coarctation of aorta. Although the PDA seemed to be shunting right to left, the lower limb saturations were 93%. In view of his symptoms and chest X-ray suggestive of increased pulmonary blood flow, he was planned for surgical ligation of PDA. Intraoperatively, CT angiographic findings were confirmed. He underwent successful PDA ligation and was discharged on the seventh postoperative day. On follow-up 3 months later he is doing well with no evidence of pulmonary arterial hypertension. This case highlights the importance of arch evaluation on echo in suprasternal view so as to prevent surprises "on table" and modify the surgical management if needed. 1. Hwang MS, Chang YS, Chu JJ, Su WJ. Isolated persistent fifth aortic arch with systemic-to-pulmonary arterial connection. J Thorac Cardiovasc Surg 2003;126:1643-4. 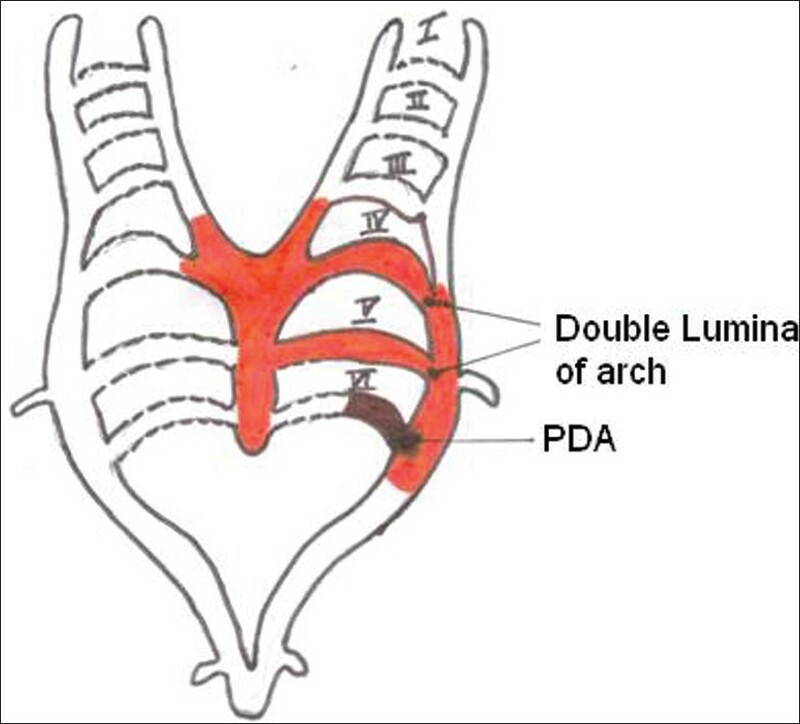 2. van Praagh R, van Praagh S. Persistent fifth arterial arch in man: congenital double lumen aortic arch. Am J Cardiol 1969;24:279-82. 3. Gerlis LM, Ho SY, Anderson RH, Da Costa P. Persistent 5 th aortic arch-a great pretender: Three new covert cases. Int J Cardiol 1989;23:239-47. 4. Lambert V, Blaysat G, Sidi D, Lacour-Gayet F. Double-lumen aortic arch by persistence of fifth aortic arch: A new case associated with coarctation. Pediatr Cardiol 1999;20:167-9. 5. Donti A, Soavi N, Sabbatani P, Picchio FM. Persistent left fifth aortic arch associated with tetralogy of Fallot. Pediatr Cardiol 1997;18:229-31. 6. Lim C, Kim WH, Kim SC, Lee JY, Kim SJ, Kim YM. Truncus arteriosus with coarctation of persistent fifth aortic arch. Ann Thorac Surg 2002;74:1702-4. 7. Wang JN, Wu JM, Yang YJ. 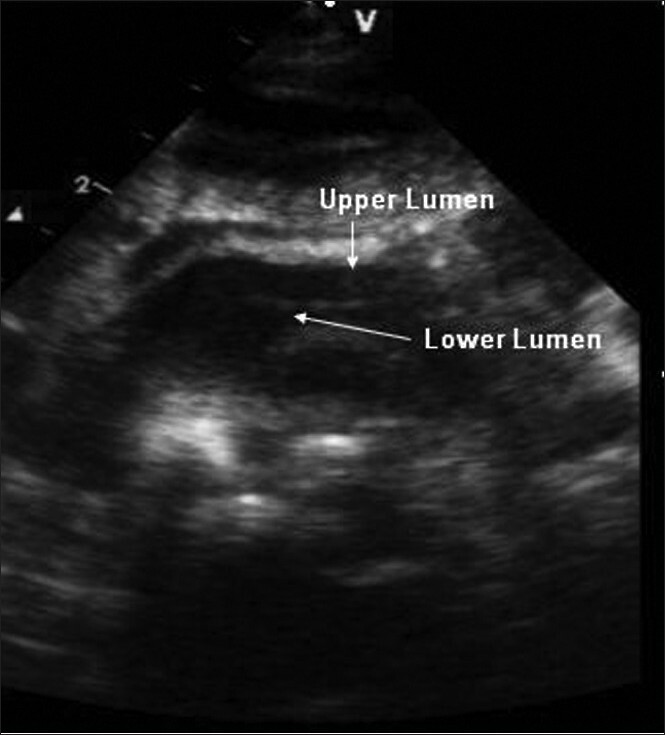 Double-lumen aortic arch with anomalous left pulmonary artery origin from the main pulmonary artery:bilateral persistent fifth aortic arch - a case report. Int J Cardiol 1999;69:105-8. 8. Einzig S, Steelman R, Pyles LA, Balian A, Millman E. Radiological case of the month. Persistent left fifth aortic arch in a child without congenital heart disease. Arch Pediatr Adolesc Med 1997;151:1259-60. 9. Park HJ, Oh JM, Park SE, Nam SO, Kim CW, Kim KI. Isolated persistent fifth aortic arch in a patient with cornelia de lange syndrome. Pediatr Cardiol 2005;26:112-4. 10. Zhong Y, Jaffe RB, Zhu M, Sun A, Li Y, Gao W. Contrast-enhanced magnetic resonance angiography of persistent fifth aortic arch in children. Pediatr Radiol 2007;37:256-63. 3 How frequent is the fifth arch artery?